Years of lifestyle choices including a bad diet can take their toll on the cells in your body. This process has been linked to age-related diseases such as atherosclerosis and cancer, with 70 percent of all cancer deaths occurring in adults 65 and older, according to the Life Extension Foundation. Fortunately, with dietary changes you can potentially repair some of the damage and live a longer, healthier life. Mitochondria are the powerhouses of cells, taking in nutrients and using them as energy. Mitochondria are susceptible to oxidants that can damage the cell overall, with the damage accumulating as you age. If not repaired, mutations begin to occur over time and accumulate until they lead to disease. Although few studies have been conducted on humans to determine the best diet to repair damaged mitochondria, research on laboratory animals has shown that certain nutrients may help, according to "Life Extension" magazine. These include coenzyme Q10, antioxidants, acetyl-L-carnitine, lipoic acid, vitamin E, lutein and zeaxanthin. Levels of coenzyme Q10 aren't well known in foods, although fish, organ meats and the germs of whole grains are relatively good sources. Foods considered to be full of the antioxidants beta-carotene, vitamins C and vitamin E include almost all fruits and vegetables. The other nutrients shown to help aren't present in large quantities in any one particular food group, although there are high levels of lutein and zeaxanthin in eggs and leafy greens. Research on animals by J. Miquel investigated whether an antioxidant diet could protect against age-related mitochondrial damage. The review, published in April 2002 in the "Annals of the New York Academy of Sciences," reported that diets with high levels of antioxidants such as vitamins C and E appear to reduce the risk of age-related immune dysfunction and hardening of the arteries. Miquel also found that other antioxidants including coenzyme Q10 may help protect mitochondria against damage and increase functional life span. Research into dietary repair of damaged mitochondria is still in its infancy, and thus it's not yet known how supplements and diets studied in the lab will affect drug interactions and disease processes. Until more is known, the best course of action may be to follow a healthy regimen such as the Mediterranean diet. Studies have linked resveratrol found in red wine and also olive oil – both staples of the Mediterranean diet – with improvements in mitochondrial degeneration. 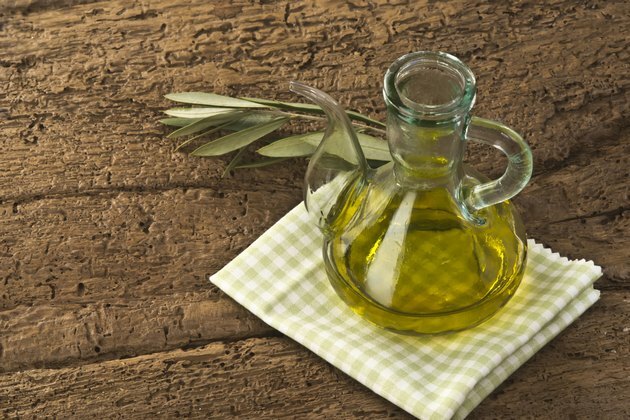 One study, led by Jiejie Hao and published in July 2010 in the "Journal of Nutritional Biochemistry," proposed that extra virgin olive oil may prevent diseases by enhancing mitochondrial function and cellular defense systems. A study by Joseph A. Baur and colleagues published in a 2006 edition of the journal "Nature" found that mice treated with resveratrol were leaner, developed significantly enhanced aerobic capacity and contained larger numbers of healthy mitochondria. To date, many of the studies looking at mitochondrial repair through diet have used various types of supplements. The National Institutes of Health Office of Dietary Supplements cautions that some supplements can cause side effects alone or in combination with other medications. They can also increase your risk of bleeding, affect your response to anesthesia during surgery, or reduce other drugs' effectiveness. You should consult your health care provider before starting any supplementation program, particularly if you are on other medications, have a pre-existing health condition, or are pregnant or breastfeeding. Annuals of the New York Academy of Sciences: Can antioxidant diet supplementation protect against age-related mitochondrial damage?